The morning-after crowd is hammering Donald Trump for intellectual incoherence, but it's a bum rap. I've gone back over the transcript of his Monday night debate against Hillary Clinton, and what I find are more provocative proposals than he quite knows how to organize. But it's clear where he's going, and by the second debate next month Trump should be able to present a national economic strategy that will sail him into office. Trump clearly grasps that America's infrastructure needs a radical rebuilding. The country, in his view, is falling apart. "It's one thing to have $20 trillion in debt and our roads are good and our bridges are good and everything's in great shape," he said. "Our airports are like from a third world country. You land at LaGuardia, you land at Kennedy, you land at LAX, you land at Newark, and you come in from Dubai and Qatar and you see these incredible—you come in from China, you see these incredible airports, and you land—we've become a third world country." But won't rebuilding America cost a fortune? Of course it will. And Trump wants to cut taxes. "And by the way, my tax cut is the biggest since Ronald Reagan," he boasted to Clinton. "I'm very proud of it. It will create tremendous numbers of new jobs. . . . I'm going to cut regulations. I'm going to cut taxes big league, and you're going to raise taxes big league, end of story." With these tax cuts, America will soon be awash in money. "Companies will come. They will build. They will expand," Trump said. "New companies will start. And I look very, very much forward to doing it." But how to translate the inevitable Trump Boom into new roads and bridges? One way to go is to count on the building and expanding to hike overall taxable revenues despite the cuts. This is traditional trickle-down economics (what Clinton referred to as "trumped-up trickle-down"), which never fails to work sensationally on the blackboards of conservative think tanks. But Trump philosophically objects to taxes. 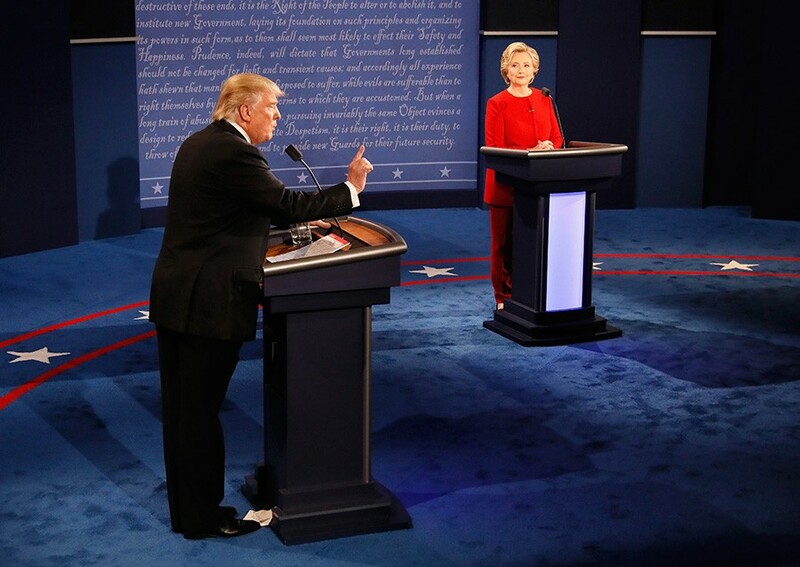 Clinton noted that past Trump tax returns that are publicly available indicate her rival has avoided paying any federal taxes at all. Trump didn't contradict her. "That makes me smart," he said. Presumably he wants other Americans to be smart too. So where will the money come from? The Chinese? That's where billions of dollars come from now, and Trump didn't sound happy. "What they're doing to us is a very, very sad thing," he said. If taxes are out, and foreign investment is out, how can Trump possibly put America in great shape again? One answer is what we might call the Chicago Model—privatization of the infrastructure. For instance, there are lots of old bridges in Chicago, a city that has already sold off its Skyway and parking meters. A visionary president might inspire Chicago to sell those bridges to a private businessman—perhaps Trump himself, who could charge some reasonable toll to cross the river and offer a discount to anyone staying in Trump Tower who has business the next morning in the Loop. And think of the transformation of the interstate highway system if it were vertically integrated into the corporations that depend on it. The Ricketts family, for instance, already Trump supporters, could take over I-55 between Chicago and Saint Louis and roll the toll into the ticket price for Cardinals fans driving up for a Cubs series. Yet I don't think this is what Trump has in mind. The clues lie in his not-so-offhand remarks during the debate. "That's called business, by the way," Trump replied when Clinton reminded him that in 2006 he said he hoped the housing market would collapse because then he'd buy up houses cheap and make a lot of money. And, of course, "That makes me smart." Trump is happily aware of how shrewd he is, and what he's obviously close to proposing is a change in the tax code under which taxes would actually double but only stupid people would pay them. Neither candidate would ever so much as hint that it's true, but half the people in America have below-average intelligence. That's plenty enough for dumb people to pay the freight for the smart people. It could work like the tax breaks we get now for buying energy-efficient refrigerators. The smarter we are the bigger the tax deduction, and someone as brilliant as Trump would pay nothing at all. Which apparently is what he pays already. I'm so far from being as smart as Trump it isn't funny, but I'm pretty sure I'd come out ahead. And so would you, dear reader. As for those who wouldn't, well, who's going to decide he'd be crazy to vote for Trump because he's a halfwit? Once Trump lays out this tax reform for the nation, the job is his. Also, Rahm introduces a new trial program to kill rats. How can journalists report with balance on an unbalanced candidate? Journalists and media watchers fret about the role of “false equivalence” in coverage of Trump and Clinton. Chicago was in the eye of the Trump storm on Friday. You’ve read plenty in these pages about the hazards of turning over roads, airports, and parking meters to private companies. But when privatization is done right, argues advocate John Schmidt, it can be an ideal partnership.